LeDuc is also chairman of Workforce Development; a committee within the NCBE dedicated to educating prospective entry-level construction hopefuls about career opportunities in the industry. Workforce Development has also teamed with local high school officials to create construction-related high school curriculums for interested students. 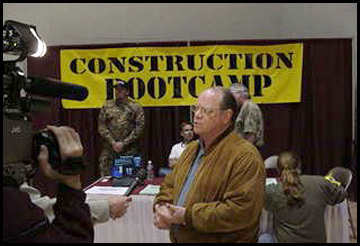 Workforce Bootcamp, which had a booth at the Expo, offers an entry-level training program for construction workers. It is based on a successful model used by the Shasta Builders Exchange. LeDuc previously installed a similar Bootcamp at LeDuc & Dexter for his employees. Tom LeDuc understands the meaning of industry opportunity. When he was 18 years old he knew he wanted to become a plumber. LeDuc had grown up close to the business since his father owned and operated a plumbing company in Santa Rosa. Faced with the decision to join the National Guard or become a union apprentice plumber during the Viet Nam era, LeDuc choose the difficult to attain plumber’s apprenticeship. He later went to work for his father’s plumbing company and then Empire Swift. From there LeDuc’s career path was set. If you were to ask one of the 18-year old students who attended the Careers in Construction Expo if they wanted to become a plumber or an electrician, a contractor or an architect, the answers would probably vary widely, vaguely and indecisively. One thing that they would probably all agree on is that this yearly event is a great introduction to the opportunities in the construction industry.